Cygnus X-1 is a black hole about 15 times the mass of the Sun in orbit with a massive blue companion star. Astronomers used several telescopes including Chandra to study Cygnus X-1. The combined data have revealed the spin, mass, and distance of this black hole more precisely than ever before. Stephen Hawking lost a bet — originally placed in 1974 — that Cygnus X-1 did not contain a black hole. On the left, an optical image from the Digitized Sky Survey shows Cygnus X-1, outlined in a red box. Cygnus X-1 is located near large active regions of star formation in the Milky Way, as seen in this image that spans some 700 light years across. 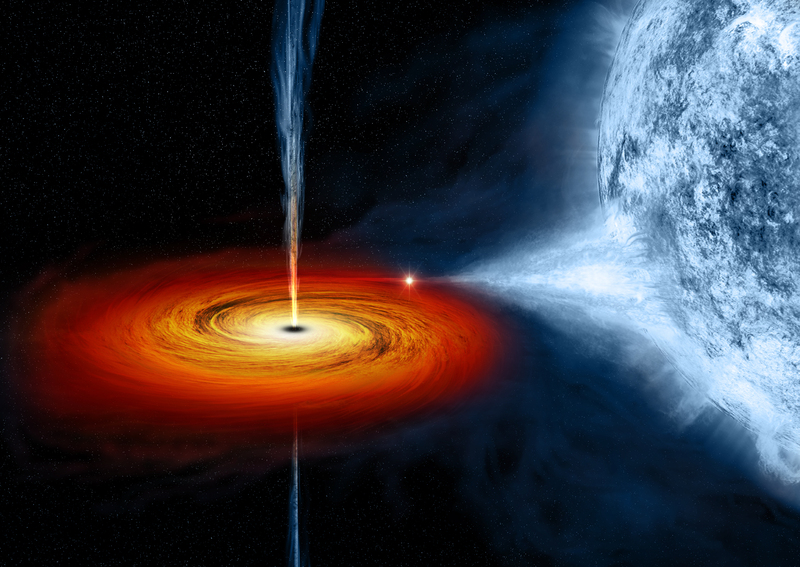 An artist's illustration on the right depicts what astronomers think is happening within the Cygnus X-1 system. Cygnus X-1 is a so-called stellar-mass black hole, a class of black holes that comes from the collapse of a massive star. The black hole pulls material from a massive, blue companion star toward it. This material forms a disk (shown in red and orange) that rotates around the black hole before falling into it or being redirected away from the black hole in the form of powerful jets. A trio of papers with data from radio, optical and X-ray telescopes, including NASA's Chandra X-ray Observatory, has revealed new details about the birth of this famous black hole that took place millions of years ago. Using X-ray data from Chandra, the Rossi X-ray Timing Explorer, and the Advanced Satellite for Cosmology and Astrophysics, scientists were able to determine the spin of Cygnus X-1 with unprecedented accuracy, showing that the black hole is spinning at very close to its maximum rate. Its event horizon — the point of no return for material falling towards a black hole — is spinning around more than 800 times a second. 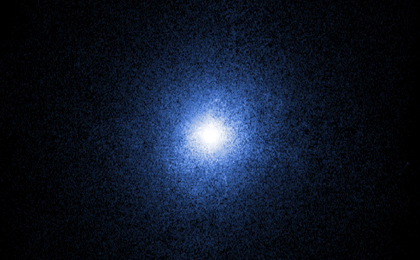 Chandra X-ray of Cygnus X-1. Using optical observations of the companion star and its motion around its unseen companion, the team also made the most precise determination ever for the mass of Cygnus X-1, of 14.8 times the mass of the Sun. It was likely to have been almost this massive at birth, because of lack of time for it to grow appreciably. The researchers also announced that they have made the most accurate distance estimate yet of Cygnus X-1 using the National Radio Observatory's Very Long Baseline Array (VLBA). The new distance is about 6,070 light years from Earth. This accurate distance was a crucial ingredient for making the precise mass and spin determinations. Coordinates (J2000) RA 19h 58m 21.70s | Dec +35° 12´ 05.80"
It is astounding the amount of undiscovered knowledge lays across the multiverse. Just looking at the map of Cygnus tonight made me think WOW. If those are all individual stars or planets. Imagine the possibilities of not only life but elements and functions we can only begin to fathom. Creative post - I Appreciate the facts. Does someone know where my assistant might be able to get a hold of a template Copyright Form VA form to type on? A note to John above who posted the distance. In the sort of notation that it is written in, perhaps it got confused. Cygnus X-1 is at a distance of six thousand and seventy light years, 6070.0ly. The picture frame is 424 x 530 ly in extent. They are really enormous numbers. And this is just in our galaxy. I understand that although black holes are voracious in their local sphere, their field of gravitational influence is not a threat to distances such as that of our planet six thousand light years. However, if their jet were aimed in our direction, we might suffer from that. How far is the companion star from Cygnus X-1? IF I could turn back the time or be reborn again I would become an Astrophysicist instead of an Engineer...All I could say is that Astrophysicist are lucky and I love them. Wow. If one of those jets hit us it would cause global devastation and enormous solar flares. That a fact. I had read that Cygnus X-1 ejected giant X-ray beams from it's poles. And that these X-ray beams can shoot across the galaxy effecting other celestial bodies. I wonder if these X-ray beams directed toward our sun can can cause solar flares? No point investing is anything else, but this vast expanse of knowledge and possibilities. Very humbling experience to view Chandra's images and the realities behind such heavenly bodies. We are insignificant in such a vast expanse of emptiness, but Chandra makes our existence significant. My respects to Chandra and always ready to provide whatever help needed. We know so less about it.Why we dont invest more in this kind of resarch....? Seems we are more busy to destroy our planet which is so fagile! This info re black holes is terrific! Please write more on the black hole in center of our galaxy, & if it will affect the Sun....Mahalo! (Means thank you in Hawaiian), since I live here on the western flanks of Mauna Kea, near our largest & newest observatories.. on the great Big Island. makes one wonder doesn't it!? How far away is this? I know it is 60.070 light years away, but how far is that? Isn't this scary close to us? wow!!! give me more like this.